Could a Vampire really have taken the life of a beautiful young woman about to give birth? Could it be threatening the life of her lovely twin sister, who shows up at the door of Sherlock Holmes in the middle of the night, desperate for his help. To Dr. Watson’s surprise, the brilliant, logical, scientific detective agrees to take on the case. Someone, in the form of a vampire bat, is murdering pregnant young woman. The step-father, the local Gypsies, and the furious future mother-in-law are all suspects. 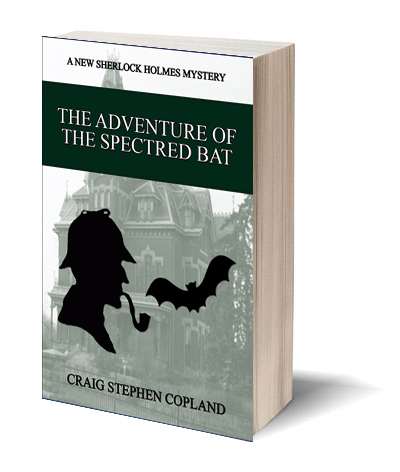 This adventure takes the world’s favorite detective away from London to Surrey, and then north to the lovely but deadly Lake District. The story was inspired by the original Sherlock Holmes story, “The Adventure of the Speckled Band” and like the original, leaves the mind wondering and the heart racing.